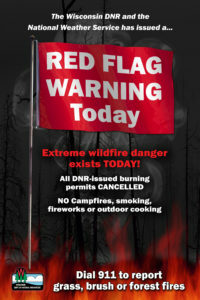 On the heels of the busiest fire day of the year, the Department of Natural Resources in conjunction with the National Weather Service has for the second day in a row issued a Red Flag Warning for today, Monday, April 30 until 7 p.m. for the following seven counties: Jackson, Trempealeau, Juneau, Monroe, Clark, La Crosse and Adams. As a result, the Wisconsin DNR is moving to extreme fire danger in those counties and will be prohibiting burning with DNR-issued burning permits and is asking the public to be especially careful with any activities that could potentially lead to a wildland fire. Campfires, ashes from fireplaces, outdoor grills, smoking, chainsaws, off-road vehicles or other small engines have the potential to throw a spark, ignite a fire and spread quickly. Please use extreme caution until the fire weather improves. A Red Flag Warning is issued when a variety of weather factors come together to create especially dangerous wildland fire conditions. Warm temperatures, low humidity, gusty winds and exceptionally dry fuels are anticipated and can result in catastrophic fires. The DNR responded to 43 wildfires Sunday, April 29. The contracted tanker planes responded to two larger fires in steep terrain in Clark county and made several successful drops. The Bruce Mound fire burned 89 acres. The Sand Fire burned 34 acres. No injuries and no structures lost. Mopping up operations will continue today and both fires are still under investigation. Much of the state continues to be high to extreme fire danger and the areas where the DNR sets burning restrictions are expected to suspend burning permits today until conditions improve. Search the DNR website, dnr.wi.gov, for keyword “fire” to continue to monitor the current fire danger and any burning restrictions.